With summer now in full swing in Park City and the winter firmly behind us (it probably wont snow again for 2 months! ), it is a great time to look at the real estate sales weve had and look forward to the rest of the year. The statistics we use here at YouInparkCity.com are derived from the Park City Board of Realtors MLS data and focus on the Greater Park City area (Park City, Snyderville and Jordanelle). We will also make some notes and special references to the neighboring Heber and Kamas Valleys. Park City, UT has a complex real estate market made up of many sub-markets; it is in-town vs out-of-town, in the Park City school district versus not, ski-in/ski-out versus a shuttle or walk (note that some consider this a four letter word) to the slopes, the Heber Valley, the Kamas Valley, Resort/Second home versus primary residence, dogs vs cats and more. Well take a look at some of these sub markets with a strong focus on prices; if weve missed something that is particularly important to you call or email us and well give you an in depth look at the area that means the most to you as a Buyer or Seller. Over 70% of the 69 condominium sales in the Jordanelle area were new construction completions. Median home prices (the half-way point in terms of the sales that were made (½ above the price, ½ below the price) rose in all areas. The median sale price in Park City proper (84060) was $1.589 M the current active inventory has less than 20% below the median sales price and fewer than 10 homes are offered at less than $1M. Outside of town proper (Park City 84098) has not quite the skewed inventory of in-town with 30% of the available homes listed below the $1.017M median sales price. Prices were up about 8% while the number of sales was relatively constant. The Heber Valley saw the largest increase in median sales price of over 20% with the median sales price there now over $400,000. As mentioned above, condominium sales within the city fell by 26% but the median sales price rose by 25% to $763,000. The Old Town area lead the price increase while the Empire Pass area saw a decrease in unit volume and in median sales price (both down over 20%). The Canyons Village at Park City lead the way up for the out-of-town Park City (84098) properties which showed an overall 5% uptick in sales at a median sales price of just under $500,000 (a 26% increase). Condominium pricing shows some of Park Citys greatest variety with studio condos starting as low as $79,000 and moving up to over $9M. Like single family homes, offerings are heavily weighted to the upper end with nearly half of all available condos asking over $1M. Tight inventory levels continue to force quick decisions as one third of all homes and condos sold so far in 2016 only lasting two weeks before being under contract. Our complex market in and around Park City provides many opportunities and a few pitfalls as well. Depending on your particular situation and location, the market may be both a Buyers or Sellers market. YouInParkCity.com can help you navigate both. For assistance from REALTORS® you can trust to help you with your Park City area properties contact the YouInParkCity.com Group at KW Park City Keller Williams Real Estate: info@YouInParkCity.com (435)962-9472. 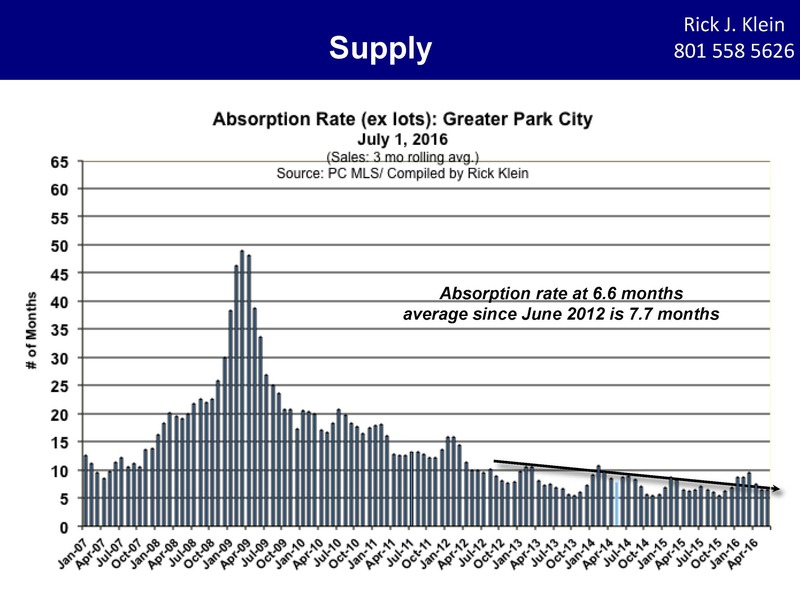 Posted in Park City Real Estate Notes, market statistics | 0 Responses to "Park City Real Estate Sales 2016 Mid-Year"